While Berlin is famous for its three-house opera system, Paris boasts at least as rich a cultural landscape. Last week, Opéra Garnier revived an Andrei Serban production of Rossini’s L’Italiana in Algeri while Cecilia Bartoli starred in another Rossini opera—Otello—at the Théâtre des Champs-Elysées. 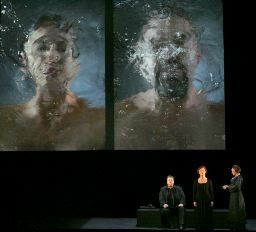 At the Opéra Bastille, Wagner’s Tristan und Isolde returned in Peter Sellars’ 2005 take featuring video art by Bill Viola. Parallel to the event, Viola was featured in an exhibit at the Grand Palais—the first video art retrospective in the history of France’s national galleries. Sellars’ Tristan, commissioned as it was under the tenure of Gerard Mortier, took on its own historic importance, prompting a moment of silence for the late impresario before the first performance on April 8. The production proves a living memory of Mortier’s risk-taking, with scenery consisting exclusively of Viola’s videos and a simple black platform on the Bastille’s enormous stage. The setting, much like the Passions Sellars has staged for the Berlin Philharmonic, draws attention to the director’s mastery of interpersonal dynamics (in German, Personenregie ), while the video art—at its best— serves to immerse the viewer in characters’ emotional worlds. Although it took a few scenes to become accustomed images such as those of Viola and his partner dunking their faces in water before Kurwenal’s entrance in the four scene, the artwork ultimately allows the characters to emerge as universal emblems of a passion that, in a very Schopenhauerian sense, transcends their physical forms. Sellars also plays with the entire dimensions of the theater to give the audience a more active experience. After submerging most of the first act in darkness, he brings up all the lights at Kurwenal’s line, “Heil, Tristan,” as if to expose the entire experience as artifice, making voyeurs out of those both off and onstage. Throughout the evening, singers and select wind instruments are placed on the balconies—such as the young sailor who opens the first scene and the solo English horn at the onset of the third act which transports Tristan. While his ascension as a rising stream of bubbles in which the body levitates from a tombstone (a video portrait which is at the end of the Grand Palais exhibit) risks being too explicit, the repeated images of water serve to engulf the viewer much as the orchestra creates an ocean of endless time. Music Director Philippe Jordan created sensuous waves of tension and release with the orchestra of the Opéra National de Paris, with particularly elegant playing in the woodwinds, while the brass was less homogenous. Violetta Urmana remained a powerhouse in the role of Isolde despite some screechy high notes. As Tristan, Robert Dean Smith did not possess the same volume but gave a performance of moving vulnerability. The bass Franz-Josef Selig was indomitable in the role of the betrayed König Marke, and Janina Baechle and Jochen Schmeckenbecher gave fine performances as the lovers’ confidantes, Brangäne and Kurwenal. Raimund Nolte was a nasal-voiced, menacing Melot; the performance of Pavol Breslik, as the young sailor and shepherd, bordered on the mannered but there is no denying the seductive qualities of his tenor. The following evening, at the Opéra Garnier, brought together a stellar cast for L’Italiana in Algeri. I have been sceptical of the baritone Ildebrando D’Arcangelo in roles such as Don Giovanni, but he seems born to sing the role of Mustafà, the Bey in Rossini’s opera who is duped into the phony rite of “Pappataci” (roughly, father of silence) which allows the enslaved Lindoro and his lover, Isabella, to flee back to Italy. The mezzo Varduhi Abrahamyan was sovereign as the Italian seductress from her first aria “Cruda sorte! Amor tiranno,” with smooth coloratura and excellent comic timing. She was more than well-matched by the Lindoro of Antonino Siragusa, whose technical assurance could blow several commercially-known tenors out of the water. The soprano Jaël Azzaretti was charming as Mustafà’s spurned wife, Elvira, leading the zany Act One stretta “Va sossopra il mio cervello” with sharp musicianship. In the role of Taddeo, Isabella’s accompaniment, the baritone Tassis Christoyannis at times stole the show with his understated physical humor even if his voice is on the less voluminous side. Credit of course goes to Serban for capturing the spirit of Rossini’s comedy in a modern context. The Bey is cast a terrorist hooligan—with furs and a golden pistol to match—while the “Pappataci” scene is portrayed with dancers dressed, respectively, as a giant bottle of wine, a pizza pie and a bed (sets and costumes by Marina Draghici). From the ape which greets Isabella and Taddeo after their ship crashes to the dancers which insinuate themselves into ensemble scenes (choreography by Niky Wolcz), there is always a great deal happening onstage, but never at the expense of distracting from the story. The male chorus—now pot-bellied eunuchs, now suited Mafiosi—were always on the mark (preparation by Alessandro di Stefano), and Riccardo Frizza propelled the orchestra of the Opéra National de Paris with high energy and clean attacks, even if rubato was wanting to create dramatic emphasis in scenes such as Mustafà’s initiation. This entry was posted on Wednesday, April 16th, 2014 at 1:15 pm	and is filed under Berlin Times. You can follow any responses to this entry through the RSS 2.0 feed. Both comments and pings are currently closed.